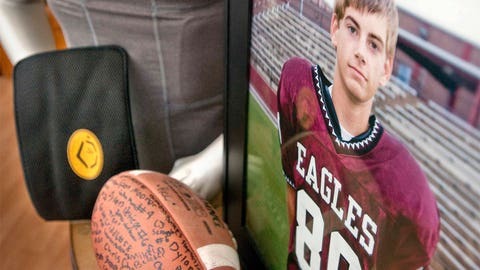 Taylor Haugen's death inspired his family to promote protective gear for other young athletes. With so much emphasis being put these days on football players aiming lower when making tackles in order to prevent head injuries, it’s easy to forget that even the “safest” tackles can be dangerous — a truth that hits far too close to home for Brian and Kathy Haugen, who lost their 15-year-old son, Taylor, six years ago following a seemingly ordinary play in a high school football game. A wide receiver on the junior varsity team at Niceville High School, located between Panama City and Pensacola in Florida’s panhandle, Taylor Haugen was running a crossing route on Aug. 30, 2008, during the team’s Kickoff Classic scrimmage against rival Fort Walton Beach when he leaped into the air to catch a pass. As he returned to the ground, Haugen was sandwiched between an opposing linebacker and safety and fell to the turf, a physical but relatively normal play in the grand scheme of a high school football game. After laying on the field briefly, Haugen got up and staggered back toward the Niceville huddle before being called to the sideline by his coaches, who sensed something was wrong. Haugen was then rushed to the hospital, where he died later that night despite doctors’ best efforts to repair a ruptured liver. Kathy said once before that he lived his life as though he knew it was limited, as though his days were numbered, and he really did. 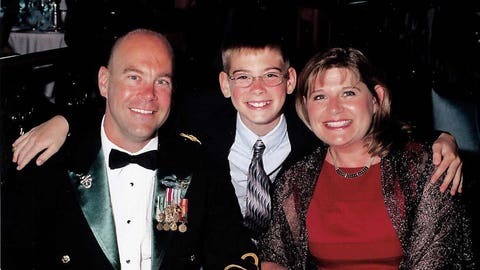 Not long after Taylor’s death, the Haugen family created the Taylor Haugen Foundation as a way to honor their son, awarding scholarships and handing out an annual Taylor Haugen Trophy to a local athlete who best embodies Taylor’s qualities both on the football field and away from athletics. The family felt there was more it could do, so in 2011, the Haugens met with a sports equipment company called EvoShield and created the Youth Equipment for Sports Safety program with the goal of reducing sports-related injuries, particularly to the abdomen, among middle- and high-school athletes. “It is a matter of honoring Taylor and kind of continuing his legacy and doing something that will have a lasting impression and make a difference and protect children and parents from having to go through what we’ve had to go through,” Kathy Haugen said. Over the last three years, the response has been good, and through YESS, the Haugen family has distributed more than 2,000 EvoShield protective rib shirts, outfitting athletes both in Florida’s panhandle and as far away as Burke, Va., Saginaw, Mich., and Millington, Tenn.
“The fact of the matter is that parents and coaches need to be proactive, and we feel like it’s our responsibility to educate consumers, parents, coaches and retailers on how to properly fit your equipment,” said Justin Niefer, a former college baseball player and co-founder of EvoShield. “Because there’s a lot of football players and a lot of athletes that go out on the field without proper-fitting equipment, and I think that’s what leads to a lot of major injury. The way the program works is YESS purchases the shirts from EvoShield at the full retail price of $90, then asks teams looking to use the gear to raise 50 percent of the cost, with YESS, which raises funds through grants and donations, matching the rest — a small price to pay, the Haugens say, to prevent another injury like Taylor’s. “We didn’t sign up for this, and we didn’t even want to do it, but it became very clear that this was our purpose and we simply can’t sit back and see this continually happen over and over and over again when we might be able to do something about it,” Brian Haugen said. “So we’re driven — unwillingly in some ways — but we’re driven. Among the challenges the YESS program faces is the fact that dangerous abdominal injuries, while exceedingly common, simply don’t tend to get the headlines concussions and heat-related injuries do. The purpose of YESS, though, is not to diminish the significance of those injuries but to bring to light another serious issue that doesn’t get the attention YESS feels it deserves. “It reminds me of when I was a kid,” Bryan Haugen said. “I’m 48, and when I was on the field if you were thirsty and you asked the coach for water, you were a pansy and told to run a lap. If it was really hot outside they’d give you a salt pill. Now we’ve come full circle and realize that heat injuries and heat strokes are a serious issue, and it took a few kids passing away on the field for folks to figure that out. Now we’ve got hydration units set up on the sideline and automatic, official timeouts for water. I think that was the first phase, the first generation of youth sports safety awareness. One thing that becomes clear when talking to the Haugens, however, is that they aren’t in any way anti-football, as some might expect. One thing that becomes clear when talking to the Haugens, however, is that they aren’t in any way anti-football, as some might expect. In fact, they say if they could go back, they wouldn’t want Taylor to have not played but rather to be better protected when he did. The summer before Haugen’s death, EvoShield had come to Niceville High and spoken to players about their equipment, but word of the presentation never made it to Haugen’s parents, a lack of knowledge they never want another family to have to live with. The Haugens don’t want ignorance to be an excuse, and as long as YESS and the Taylor Haugen Foundation are able to play a role in eliminating the types of injuries that claimed their son, they’ll be committed to doing so. You can follow Sam Gardner on Twitter or email him at samgardnerfox@gmail.com.